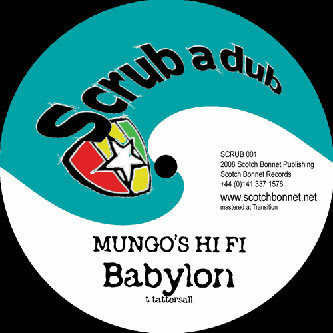 Scorching hot soundsystem killers from skilled operator Mungo's Hi-Fi initiating the new Scrub a Dub side label for the Soundsystem crew with one keen redeye on the Dubstep market. Title cut 'Babylon' was picked up by Appleblim for his Dubstep Allstars mix last year, and recieves a full blooded 12" cut here brimming with System primed delay and reverb interplay on a truly badass steppers riddim sounding a million times more effective and authentic than 99% of the dubstep dilettantes. Trust us, this one's a killer! 'Dubplate Fi Dem' on the flip is another drop and destroy joint, brewing up an evil bass riff with authentic chat and filtered rave signals to wild the dance. Huge plate that fans of RSD, Appleblim, DMZ and the real good stuff will hoover up. Tip!